The lambda phage is a model organism studied in biology laboratories. The lambda phage is a virus which belongs to the Siphoviridaefamily. It infects the bacterium which is widely used in the laboratory, Escherichia coli. The lambda phage has a 48,500 base pair, linear, double-stranded DNA genome which has been entirely sequenced. 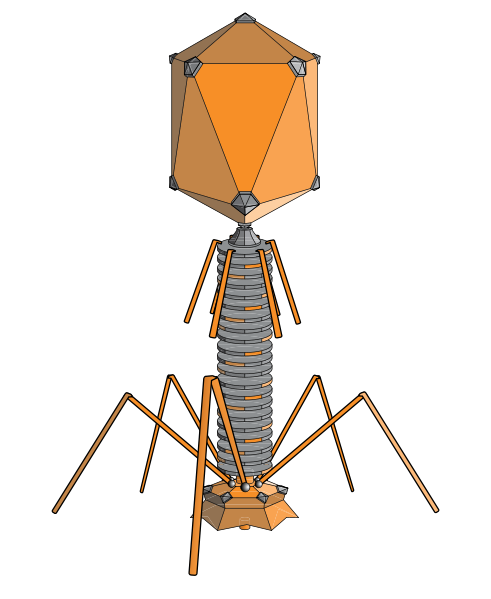 It has the typical shape of a bacteriophage, a head in which the DNA is encapsulated and a tail and fibrils which enable it to attach itself and insert its DNA into the cell. the lysogen cycle, in which the viral genome is incorporated into the bacterial genome (as a prophage) and where the latency genes are expressed. The lambda phage is studied to improve our understanding of host-virus relationships and also as a cloning vector.